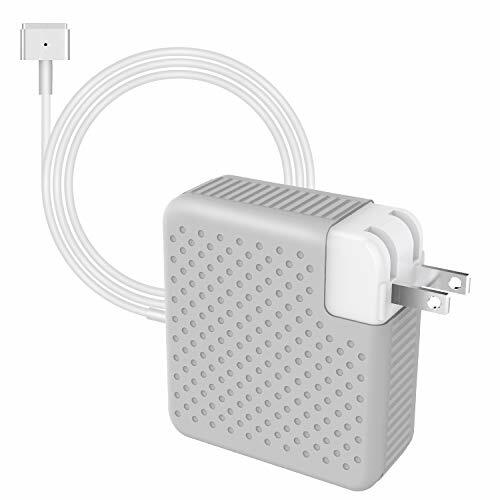 MITIME, a professional power adapter company, we are devoting to make the best replacement power adapter for you. Whether you need a replacement or a spare one, this is perfect for you. We provide one month money return guarantee, one year warranty and 24Hx7 e-mail support. Specification: Input: AC 100-240V, 50-60Hz; Output: DC 18.5V-4.6A. Wide Compatibility: Compatible Style Number: A1398,A1425,A1435,A1465,A1502 Compatible with Macbook PRO 15 OR 17 inch: MacBook Pro (Retina, 15-inch, Mid 2015) MJLU2、MJLT2 MacBook Pro (Retina, 15-inch, Mid-2014) MGXC2、MGXA2 MacBook Pro (Retina, 15-inch, Late-2013) ME293、ME294 MacBook Pro (Retina, 15-inch, Early-2013) ME664、ME665 MacBook Pro (Retina, 15-inch, Mid-2012) MC975、MC976 Compatible with Macbook PRO 13 inch: MacBook Pro (Retina, 13-inch, Early 2015) MF839、MF840、MF841、MF843 MacBook Pro (Retina, 13-inch, Mid 2014) MGX72、MGX82、MGX92 MacBook Pro (Retina, 13-inch, Late 2013) ME864、ME865、ME866 MacBook Pro (Retina, 13-inch, Early 2013) MD212、ME662 MacBook Pro (Retina, 13-inch, Late 2012)MD212、MD213 ※Above is just a partial list, please kindly check your MacBook Model and confirm if it works for you. Note: 1.Keep the power adapter away from water and fire. 2.Pay attention on the voltage and power of the charger before buying. 3.This is the second generation of magsafe power adapter (T-Tip), not the first generation; Please check clearly your MacBook model before buying! ★WIDE COMPATIBILITY: MacBook Pro 13inch, 15inch and 17inch. Compatible ( T-TIP ) Number: A1343, A1174, A1290,A1222, A1172, MacBook Pro (Retina, 15 inch, Mid 2015), MacBook Pro (Retina, 15-inch, Mid 2014), MacBook Pro (Retina, 15-inch, Late 2013), Macbook Pro (Retina, 15-inch, Early 2013), MacBook Pro (Retina, Mid 2012). ★MAGNETIC DC CONNECTOR: MITIME 60W MagSafe 2 Power Adapter features a magnetic DC connector, if someone should trip over it, the cord disconnects harmlessly and your MacBook Pro stays put safely. It also helps prevent fraying or weakening of the cables over time. In addition, the magnetic DC helps guide the plug into the system for a quick and secure connection.